To combat black fly and other blood-thristy bugs, experts recommend using insect repellent, wearing light-colored clothing and covering the neck and hair lines. Once you discover a bite, wash it vigorously to remove the fly saliva and apply an anti-itch lotion or cream. Some people use ice to reduce swelling. Danniele Hall was with her two young children and dog in the Dishman Hills when the black flies attacked. Her daughter’s ear and neck became swollen and one of the bites on her son was turning into a blister. Even the family dog suffered bites on his stomach. “It’s as if they’re feeding on our skin!” she said. Sera Bera said that after an attack, her daughter is now scared to play outside. She rubs her hair and cries, “Bugs, Mommy,” Bera said. Mary Douthitt said she went to a Spokane nursery last weekend and was attacked by what she thought were large gnats. Mary Gatz, who lives next to the Spokane River near Argonne Road, said her yard has been swarming with the flies. An outbreak of biting black flies is spreading in pockets across the Inland Northwest, bringing misery in the form of itchy bleeding bite wounds and allergic reactions. “They are out there looking for blood,” said assistant professor Jeb Owen, an entomologist at Washington State University. Because flowing water is a key part of the black fly life cycle, this year’s heavy precipitation may be at work, he said. One woman, responding to a Facebook request for black fly information, said that she and her family were attacked within minutes of arriving at Manito Park on Saturday and forced to flee. For most people, the bites are painful and slow to heal. For those who have strong immune reactions, they are likely to cause swelling and general illness. Those with strong reactions often go for medical attention where antihistamines and possibly antibiotics may be prescribed. The flies are considered more of a nuisance than a serious health threat since they do not carry infectious diseases, experts said. A person may never even feel the bites of the flies, which are very small – about the size of a piece of cracked pepper. Some victims have reported being swarmed. The fly feeds on blood with an insidiously effective biological game plan. Their mouths inject saliva with an anti-coagulant to keep blood flowing. The saliva anesthetizes the wound for a period of time, helping the fly go undetected in its sneak attack. Many people don’t realize they’ve been bitten until later. Experts say the best protection is a bug repellent with DEET, which is safe for adults. Also, light-colored clothing, a hat and scarf will help. Allison Brown, 49, said her bite reaction was so bad that she had to go for urgent care after being attacked on the back deck of her Spokane Valley home on Saturday evening. The bite on the front of her head along the hair line grew into a red, round mark about 3 inches in diameter, she said. By Tuesday, when she saw a nurse, her face was swollen. “I can barely see out of that eye,” she said Wednesday. She received a shot of a nondrowsy antihistamine and antibiotics since the bite wounds can lead to a secondary bacterial infection. Black fly attacks can be sudden and vicious, depending on the number of insects near you, victims said. Owen said the larvae of black flies attach to rocks or concrete in flowing water and can survive the winter. The water might be no more than a rivulet, he said. The flies emerge as the weather warms and the days lengthen. As the flies leave the water, they can form large clusters. “They can really emerge in remarkable numbers,” Owen said. In large swarms they can “literally kill large animals,” he said. Their size is small, no more than a millimeter in length. Curiously, they are very sensitive to pollution and need a clean water source. Once in the air, the are “very good flyers” reaching distances of up to 10 miles, carried sometimes with the wind. In Alaska, they have been reported in swarms so thick they looked like smoke, Owen said. What gives victims away is their breath. The flies seek out their hosts (victims) by flying into a trail of carbon dioxide. Once they reach the target, evolution tells them to key in on the dark color of animal hair. The insects evolved as different related species. One type goes after rodents at ground level. Other types search for deer at about the height of a human’s shoulder. Still others go after birds, Owen said. The flies then go for openings in the hair, which explains their preference for the back of the neck at the hairline. Owen recommends using repellent with a strong amount of DEET, which he says can be effective. 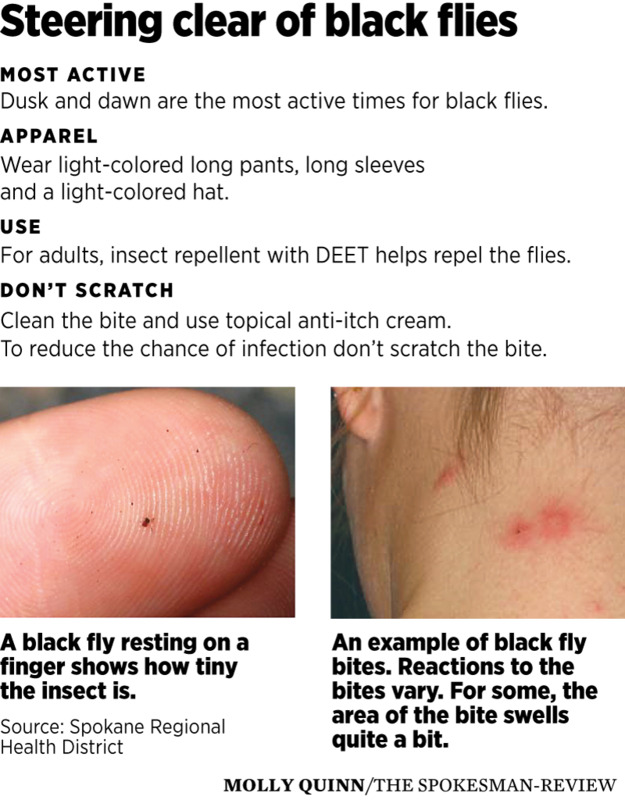 “People should be wearing DEET anytime there is a risk of being bitten by blood-feeding insects,” he said. DEET also repels mosquitoes, which are increasingly being viewed as a threat of carrying West Nile virus, and ticks, which can carry Rocky Mountain spotted fever, he said. Kim Papich, spokeswoman for the Spokane Regional Health District, said her agency saw an upswing in calls starting a week ago. People should check with their health care providers if their bites are causing trouble. The health district recommends a thorough washing of the site of the bites to eliminate as much of the saliva as possible. Then, victims should use an anti-itch cream or lotion, and consider taking an allergy medicine such as Benadryl. Dogs are also susceptible to attack. Readers reported that their pets were getting numerous bites from dozens of black flies. In North Idaho, the Panhandle Health District also reported an upswing in black fly calls. Christine Fowler said that for some reason the flies attack her and not other family members. An avid gardener, she said she didn’t feel the most recent attack last Monday. “I didn’t feel anything until I came inside,” she said. Family members saw blood streaming from her neck. Later, she developed a “terrible headache” and her glands in her neck swelled. She said she uses cortisone cream to ease the itching, along with Benadryl to slow the reaction. Kevin Morrison, spokesman for Spokane Public Schools, said he checked with a number of elementary schools and the district’s supervisor of nurses and learned that few students had complained of bites. That could mean that the swarms are in isolated clusters closer to flowing water. But they are on the move, Owen said. How long the black fly season will last is anybody’s guess, but Owen said he expects the season to last longer than normal, probably well through summer. Published: June 2, 2017, 5 a.m. Updated: June 2, 2017, 11:53 a.m.